In my post Nice tools/services (for free) … and other useful links I already listed Audacity as a very nice tool. 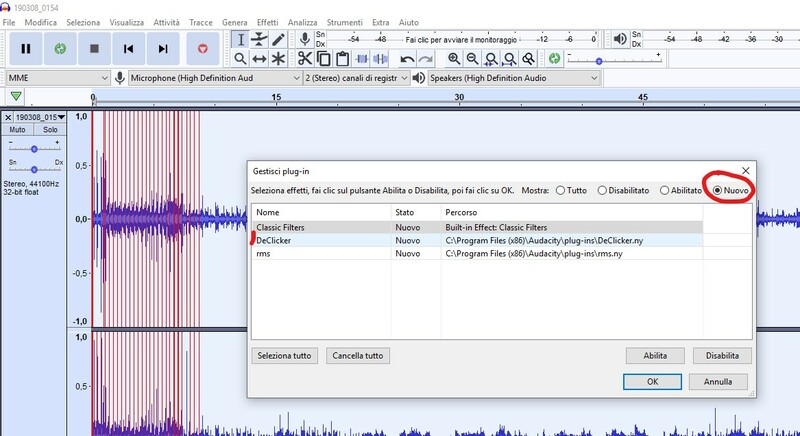 I already said that it is a free multi-track audio editor and recorder (for Windows; LADSPA plug-ins 0.4.15 installer. It contains over 90 plug-ins (i.e. Plug-Ins) that you can download to use additional effects and filters: you can find even more looking into its forum. 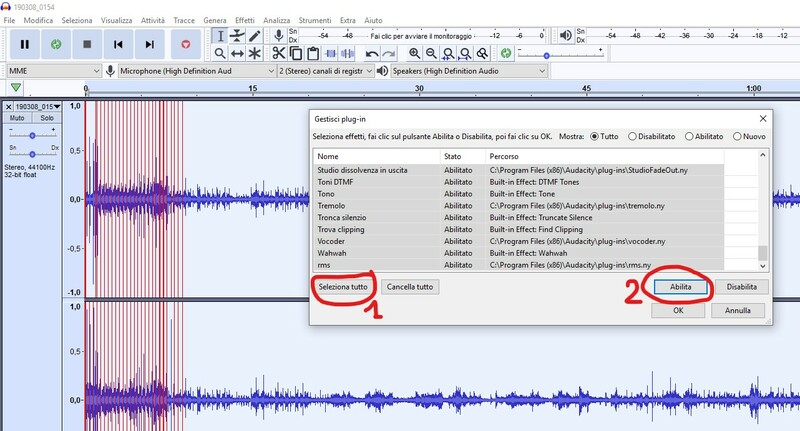 For example you can find a De-Clicker and new De-esser for speech plug-ins that you can add in Audacity in order to use some them. 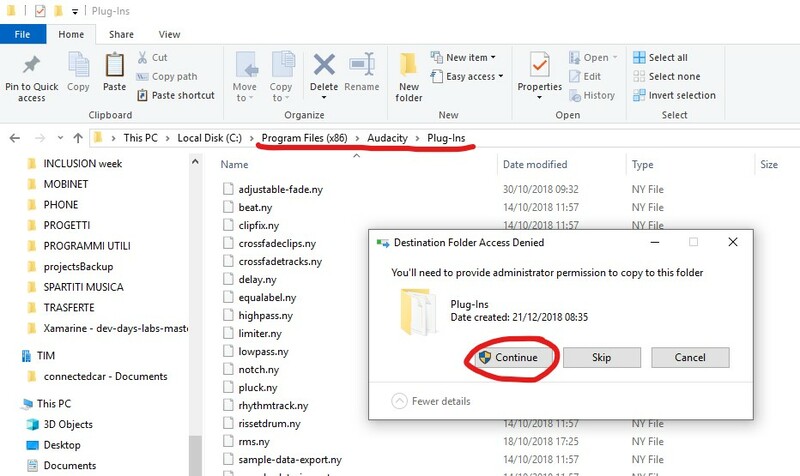 The following link allows you to add the LAME MP3 encoder – so allowing Audacity to export MP3 files. As an payment alternative (limited free use): GoldWave or Sound Forge Audio Studio. In the following there are some screenshot that show how to import and use a new plug-in (e.g. De-Clicker). First you need to download the plug-in for example from an post of the Audacity forum. Finally, from the Effects menu item, select Add/remove plug-ins: you can choose to select all pug-ins and activate all of them or select New and enable the ones you want to add (e.g. DeClicker). As written by the autor, De-Clicker is designed for filtering of natural but undesirable noises that take a few milliseconds to decay, not for repairing spikey damage to a digitized signal. I did not intend this for music or vinyl repair, but I would like to hear whether it has unexpected other uses. The default settings in both tools are the ones I favor now for treatment of whole tracks. Do you have different opinions about good default settings? Let me know. I successfully treat most of the more resistant clicks by hand with a single pass and double the number of bands: NOT by lowering the dB threshold control. But such settings may be too slow and too aggressive for batch treatment. Yet the nice thing is that you do not have to select the interval around the click very narrowly. The surrounding signal is usually unaffected. So select it and fix it and move on, don’t fuss with zooming in and out. I treat typically no more than a half hour at once. Compute time does unfortunately go nonlinearly with length of the track to some extent. Not sure why. (I’ll blame garbage collection.) But I have improved performance much over the previous version. As mentioned below, do low-frequency rolloff (highpass filtering) before De-Clicker for slight improvement of some results. In either tool, choose Apply Changes to hear just the results. Or, choose Isolate Changes to hear only what is subtracted from your signal. You don’t want to hear a lot of “murmur” so that you almost understand the words: your settings are taking overtones out of your vowels and muffling the voice. You may notice that the attack of many consonants is somewhat affected, but you might judge that this is acceptable and sometimes even helpful. If you duplicate a track, then isolate changes in one, you can listen to the tracks together to hear the repaired sound (the isolated clicks interfere destructively), or mute one to hear just the original or just the subtractions. You might silence corrections you don’t want before mixing. I don’t do any of this once I find settings I trust. Both tools specify a range of frequencies and a number of frequency bands (of equal width in log-frequency) for detection and repair. Impatient for results? Use fewer bands, or raise the bottom of the range. I find it valuable to repair the low frequencies too in speech (certain lip-closing thumps and rattles in the sibilants get removed) but the lower frequency bands do take more computation time. De-esser performance is not too bad with many high frequency bands: but very few bands may give poor results, affecting vowels. Both tools specify a step size for precision in identifying the intervals to repair. You might trade precision for speed. Both tools specify another time period for cross-fading of repairs around each clicky interval. Make it too short and you introduce undesirable artifacts. This setting should not affect computation time significantly. The De-Esser has a dB threshold which is the amplitude within each frequency band, to which, the band is trimmed back. -20dB is my default setting, and -20dB and above is also what appears white in spectrogram views with default settings. De-Clicker has a threshold in dB which is not absolute, but relative: a band must rise so much over a short interval for a click to be detected. I repeat, subtle clicks may be treated better not with a lower threshold, but with more numerous and narrow bands. De-Clicker specifies a minimum separation between clicks. Make it too small, and more clicks will be identified, but there may be too much damage to voice when it drops in pitch. There is also a dB threshold (for the entire signal) below which closer clicks may be detected. This may help clean up crackles in de-voiced intervals and breaths. Use low-frequency rolloff effects first for better results! De-Clicker can specify a number of times to repeat treatment, and a maximum click length in steps, which need no explanation. 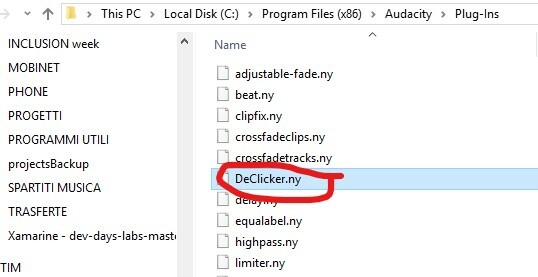 De-Clicker can also just make labels around clicks without repairing them. This information may be useful, for instance, if you want to find dB threshold setting just low enough to detect certain of the clicks. 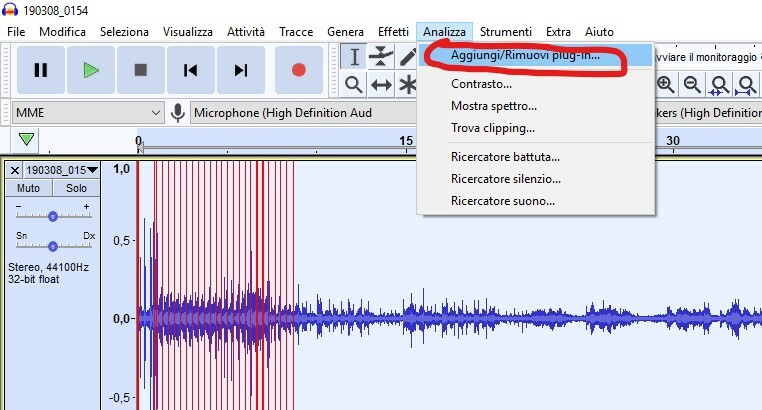 Questa voce è stata pubblicata in Review e test, Tecnologia, Windows. Contrassegna il permalink.